Until about two weeks ago, Anvit Rai wasn’t familiar with the concept of colorism. 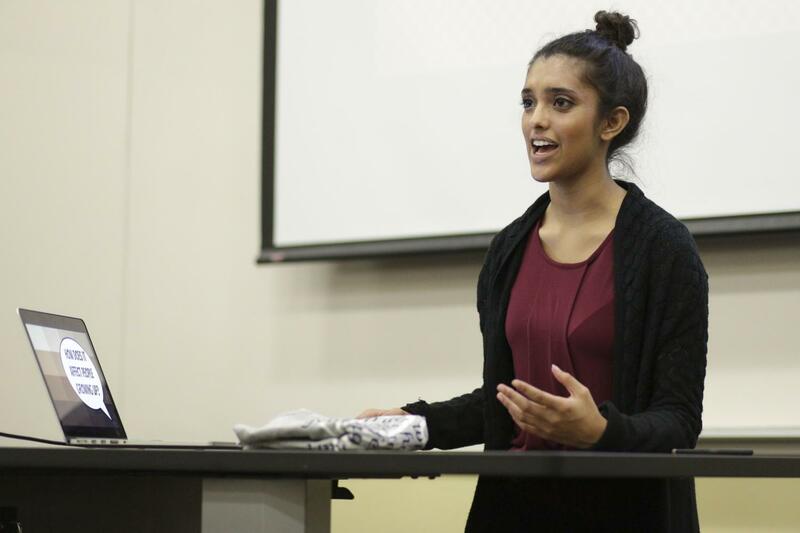 More than 50 students joined Rai in David Lawrence Hall Friday evening to participate in a discussion titled “Let’s Talk About It: Colorism.” The South Asian Student Alliance hosted the event in collaboration with the Black Action Society. The event educated students on the differences between colorism and racism, the importance of identifying colorism and how to eradicate the issue. In their initial presentation, SASA defined colorism as, “the prejudice or discrimination against those who have darker skin.” Racism, on the other hand, is the general mistreatment of people of different races, according to SASA. SASA explained colorism typically exists within an ethnic group, whereas racism transcends ethnic groups. Colorism involves instances where two people of the same race — but different skin tones — are treated differently. Rai, a senior studying neuroscience and the president of SASA, said the group wants to hold these discussions to highlight societal issues the organization feels are not being examined closely enough. “The whole idea with why SASA has these [events] is we want to highlight issues in our society that we as an organization feel are not getting their due diligence,” Rai said. Rai said in choosing a partner organization for the event, the Black Action Society stood out to him. For a majority of the event, students shared their own personal experiences and discussed how certain issues affect minority groups differently. A number of students said as children, their parents discouraged them from going outside, for fear of them becoming darker. Rai shared an experience from kindergarten. He said he was teased since there weren’t many Indian children in his class, and when he told his parents, the amount of time Rai was allowed outside was limited. “Instead of my mom taking it in the sense of, ‘Why are these kids calling you brownie?’ it was more like, ‘Why are you turning more brown? Why are you turning darker? Why are you not a lighter skin color?’” Rai said. Another common experience many students shared was the practice of skin bleaching. During the discussion, Karee-Anne Rogers, a junior English writing and Africana studies student, recalled an experience with skin bleaching that a close family friend encouraged. Rogers said other stories of skin bleaching she heard during the discussion were “striking.” During a small group discussion, another student talked about her mother making her use a bleaching cream she was allergic to as a young child. Nkeiruka Nwobu, a senior psychology student, said she didn’t find the stories of skin bleaching surprising, just sad. Many students said it’s important to note parents aren’t using these practices against their children with malicious intent. Many said their parents believed having lighter skin would provide them with a better life. Rai said he believes skin bleaching is a gendered issue, saying the pressures for women to attain societal beauty standards are far greater than those for men. While it’s good to discuss colorism and the systemic effects it has on people of color, Nwobu said, not enough is being done to discuss the cause of the problem. Rai agreed, saying more awareness is needed on the issue.